We recommend you to park at Marktgarage. This parking is good affordable and is less then a five-minute walk. The address is Willem Naghelstraat 1. Parking near the canal of Oosteinde is only possible when you have a license of Area B. When you don’t have this license, you can buy a day-ticket for €24,10. Next to the door are two handicapped parking spaces available. 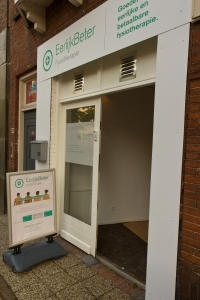 It’s a 5 minutes walk from Central Station Delft to our practice, that’s like approximately 450 metres. With public transport it is a 1 minute walk (75 metres) to busstop Burgwal, take bus 81. It’s a 8 minutes walk to busstop Zuidpoort Delft (650 metres). Take bus 121, 37, 60, 69, 80, 174, or 40.